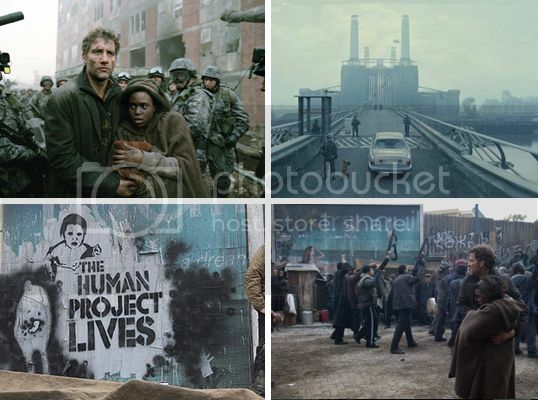 Back when Children of Men came out, a lot of people took it as an incoherent parable for the modern day problems of Guantanamo and Abu Ghraib; Western paranoia of encroaching terrorist agendas leading to a Big Brother lockdown, etc. We were surprised that what we considered to be the driving symbolism of the movie - that is, orthodox Christianity - was instead downplayed or ignored completely. Did no one get it!? The year is 2027 and Britain is a dark, crummy dystopia that no one likes. It's still better than the Rest of the World, which lies in literal ruins - fire, rubble, AK-47s. "Fugees" - i.e. non-British - are detained in filthy prison colonies on the southern coast of England, and meanwhile a terrorist organization calling itself the "Fishes" is planting bombs in downtown London coffee shops. What a mess. Various scenes of wreck and ruin and... Bansky? But the main problem is humanity's sterility. For 18 years, not a single baby has been born. 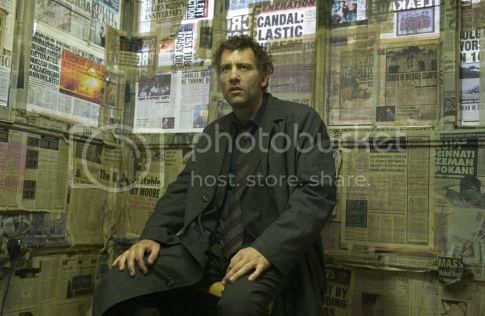 The film opens then on Theo (Clive Owen), a rumpled bureaucratic drone, never too far from some liquor, who lives a wretched half-life in this childless purgatory. One day, Theo is contacted by his former flame, Julian (Julianne Moore), who asks him for some rare "transit papers" to help a friend get off the isle (and the Casablanca bell goes CLANG! hooray!). Theo reluctantly agrees to help, even though Julian is mixed up with the Fishes and their charismatic (well, we think so) leader, Luke (Chiwetel Ejiofor, always great). Of all the gin joints! Theo is then shocked to learn that Julian and the Fishes are secretly protecting none other than the World's Only Pregnant Woman, Kee (Clare Hope-Ashitey), who is in her eighth month (she thinks - everyone's sort of forgotten how this pregnancy thing works). Theo, Julian and the Fishes are now all competing to help Key get to the "Human Project" - a rumored Eden where humans aren't stuffing each other's heads into black bags and pushing them into detention centers. Insert also one extremely off-the-grid, pot-growing, old hippie Jasper (Michael Caine, always lovable) and shake well. 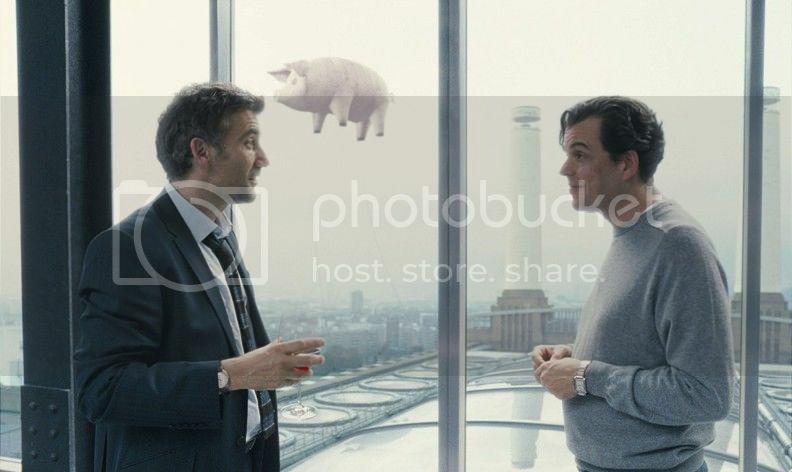 Clive Owen and Danny Huston, in a brilliant "brick in the wall" scene. We're starting to think no one on Earth appreciates Danny Huston the way we do. The man is AMAZING. Just watch The Proposition and you'll see. Much of the film is, as you would expect, an exercise in dystopian misery. The tone is perpetually bleak, and the slightest levity is only the cynical, sarcastic kind. This film is also very self-aware; i.e. it knows its roots. For example, a brilliant scene featuring the brilliant and underrated Danny Huston as a "Noah of the arts", living alone with his deranged 20something son in a revamped Tate Modern, manages to throw in a Pink Floyd cover. And there are the obvious allusions to 1984 or Brave New World , what with the government-approved suicide rations and overbearing bureaucracy. But the film is mostly about the Bible. We think. This is a very classical, orthodox Christian story, stuffed full of allusions: Theo, underground fish and miracle babies. Director Alfonso Cuarón is only using these Abu Ghraib-type aesthetics in the same way he uses the 1970s acid rock (King Crimson! ): as a familiar, modern idiom to get across a very ancient story of miracle and saviors. When Kee reveals her pregnancy to Theo, she's in a manger. Theo's last words in the film are, "Oh, Jesus." Danny Huston's character could be Pilate. And one of Jesus' titles was the Son of Man - just pluralfy that and you get the title. Indeed, it's a very fun story to pick apart, as the Christian symbols are layered everywhere. Personally, we felt like Indy at the end of The Last Crusade (remember: there is no "J" in Greek). Ahem, "Theo", meets the, ahem, "Fishes". Another notable feature about this film is Cuarón's use of really, REALLY long takes. There are three in particular, each lasting as much as ten minutes (!). That's ten minutes of a single shot. The most impressive of these, by far, is the one in the car. This is an early climax in the film, and it begins when Theo wakes up from a nap, the camera slowly zooming out from him. Watch out for it. The entire thing is filmed on a single camera, spinning deliriously within a cramped, cluttered car. And from that single shot, we manage to witness the build-up, climax and after-effects of a chaotic action piece. It's a testament to everyone involved - Cuarón and the actors, especially - for making such an impressive, uninterrupted piece of movie magic. Oh yeah, and it's based on a (waay more obviously Christiany) book by P.D. James . Yes! 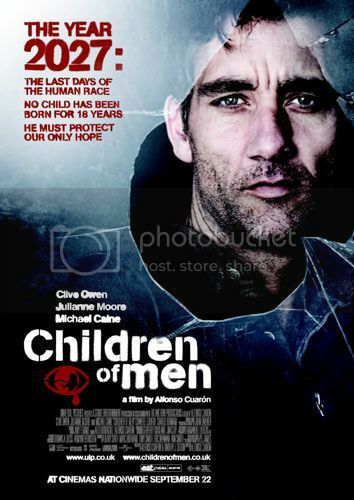 This film is one of my favorites and Clive Owen (an actor I like a lot) is top notch in it, and this is one of the films where I wouldn't change any of the actors. Cuaron is a great film maker, one with vision and capability.